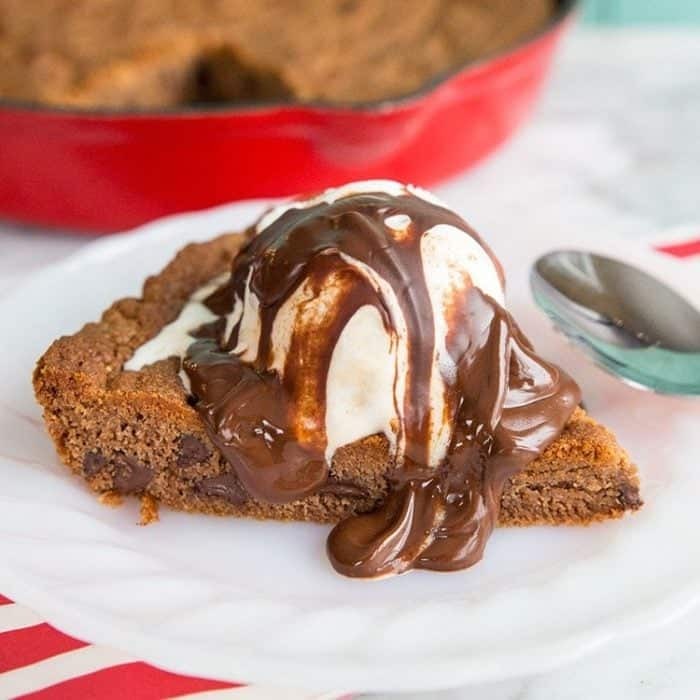 This Reese’s Chocolate Chip Skillet Cookie is so easy to make that I feel that it’s my obligation to warn you now that this skillet cookie is WAY too easy to make and you should read on at your own peril. Sometimes, too much knowledge is a bad thing and this might be one of those instances. This post is another decadent delight thanks to my delicious partnership this fall and winter. 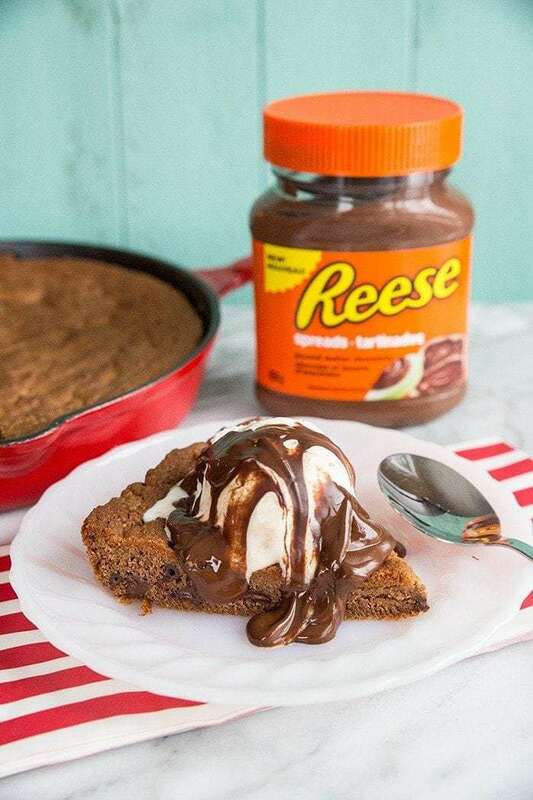 I’m taking part in Reese’s Golden Spoon Recipe Series, which in a nutshell means that I’m going to be making some decadent recipes for you to try out using Reese Spreads. Because chocolate and peanut butter, man. My first recipe was my Chocolate Peanut Butter Banana Cake and it’s delicious to the M-A-X. Easy, as well, and something that uses up all the bananas that you have stored in the freezer. This recipe is alllll about the cookie. I have to admit, this was perfect on a chilly Sunday afternoon. While I could do without the snow, I am always so happy to get back into the colder weather baking. We don’t care that we turn on the oven and can make whatever we want. Today I made butternut squash soup, baked 2 dozen buns, two loaves of bread and this skillet cookie. Oh Sundays, I love you. Technically I was working all day today – and I still am at 6 PM as I write this- but it was a lovely day of baking and cooking today. I can’t complain when my job entails working on decadent desserts like this baby. I’m pretty sure that the word “lucky” applies to me most days. MOST. Let’s also remember I’m a Mom and a Wife and sometimes you just can’t help those days when you are tearing your hair out. However baking something like this is a sure-fire way to cheer yourself up. The Reese’s Spreads made this a darker cookie as you can see from the photo and added a peanut butter taste that I love. This cookie should always be slightly under-baked AND always served warm. Very warm, in fact. 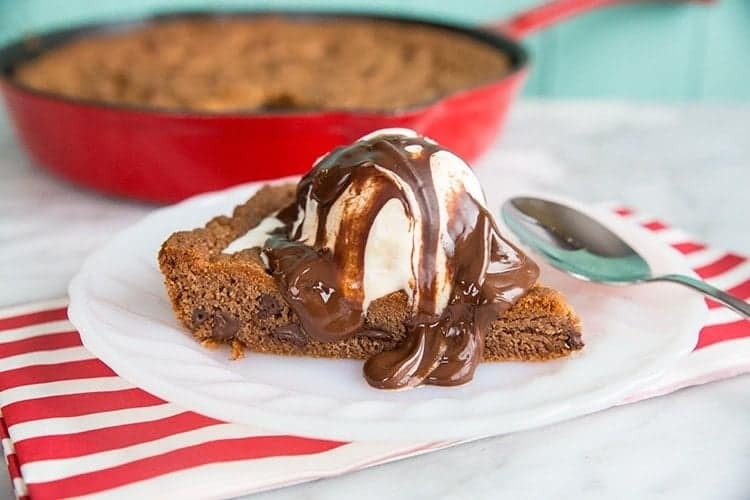 Skillet cookies are the best when they are warm enough to get that ice cream melting on top. I was a crazy, wildly impetuous food blogger and used butterscotch ripple ice cream, topped with chocolate sauce instead of plain ol’ vanilla. I’m pretty sure that you should do the same. The butterscotch ripple ice cream on top was so good it was unbelievable. Granted I don’t think that there are many flavours that wouldn’t go with this skillet cookie, the sky is pretty much the limit. Happy baking everyone! Love you more than chocolate! This is a sponsored conversation written by me on behalf of REESE Spreads. The opinions and text are all mine. 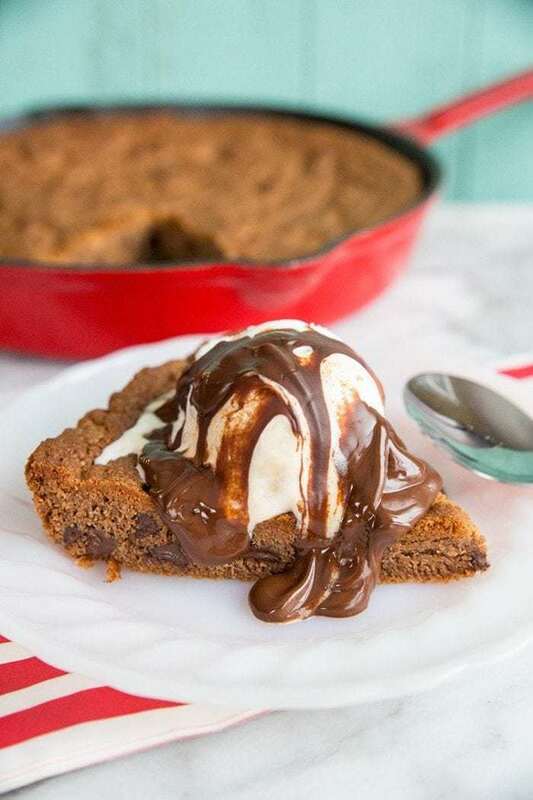 This decadent Reese's Chocolate Chip Skillet Cookie is so decadent and so easy to make from scratch! Cream together the butter and Reese's Spread until smooth and creamy. Add in the brown sugar, beat again until creamy. Add in the egg, followed by the vanilla and mix until thoroughly combined. Whisk together the dry ingredients then slowly add to the mixture, mixing until combined. Press the dough evenly into a seasoned cast iron skillet. Bake for 20-25 minutes until the cookie's edges are browned yet the middle is slightly underdone. Eat while still warm, topped with vanilla ice cream and chocolate sauce if desired. Wish I had NOT gotten a glimpse of that: how can I pass up anything with Reese’s? It’s not easy! 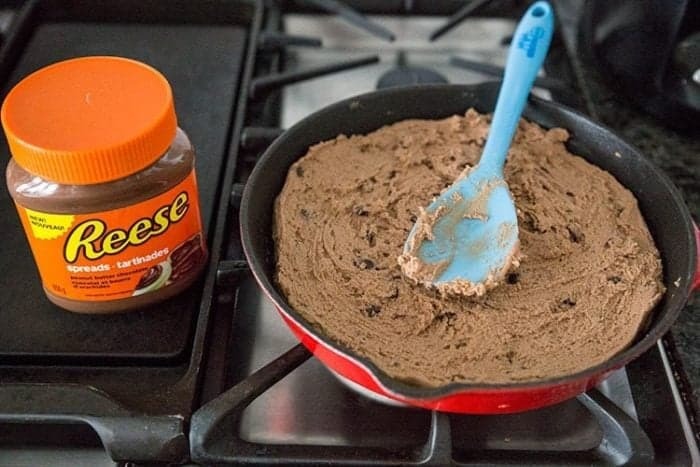 Sprinkle some Reese’s cups on top as well…yum! Oh, I am going to make this!